a chance to share your work with a broader audience after your project is complete. To help encourage you to share your idea for building character in your students, I've prepared a special list for you. I've heard these reasons from smart folks who hesitate to apply; below each, please see my thoughts and advice. 1. Up to a mere seven proposals will win, but hundreds will apply. There's no way I'll win. It's not worth it! 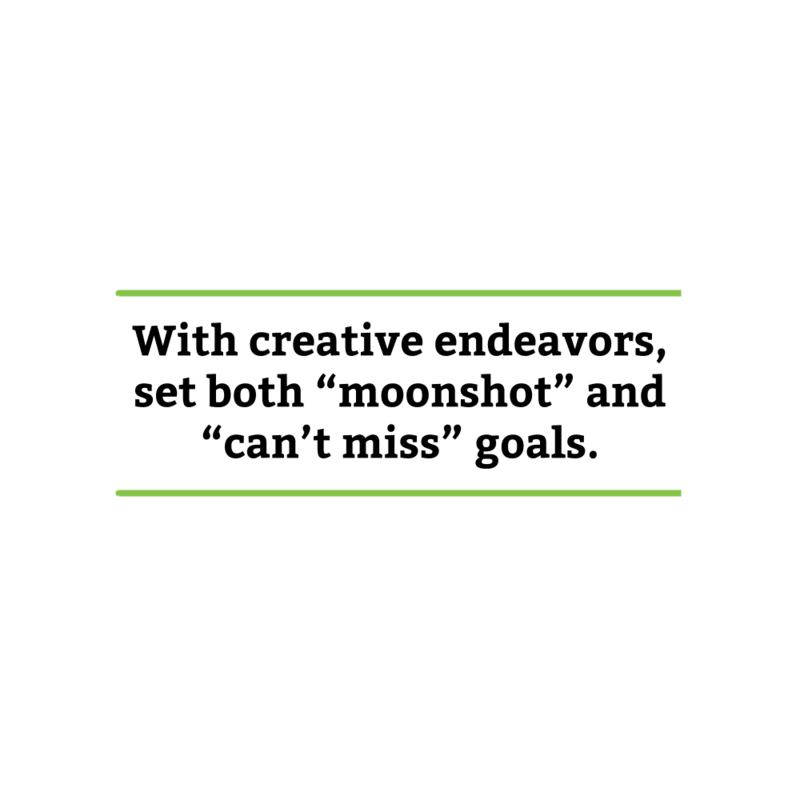 When I set out on the TIG quest last fall, I told myself the same thing I did when I began this blog: there was no way it would be a waste of time if I set both “moonshot” and “can't miss” goals. Your moonshot goal in applying for this grant is that you'll win! You'll get this awesome PD experience, you'll get to meet Dr. Angela Duckworth, and you'll get cash-money! But there are some hugely valuable “can't miss” goals, too. For example, going through the application process is bound to help you clarify your thinking around something you do in your classroom. Clear thinking yields better, saner teaching. View this as a chance to reflect on what you do and communicate it as best you can. If all you have is the moonshot goal, then I agree — it may not be worth going through some drafts in the proposal-preparation process. But if you've got some “can't miss” goals as well, then this is a no-brainer. Also: new this year is the fun fact that all finalist proposals (up to 20) will receive $250 mini-grants. Booyah! 2. I don't have time, man! 1 hour brainstorming with like-minded, character-teaching colleagues in my school. Each of us spent 15 minutes or so being the focus of the group's conversation. The goal here was to come up with viable ideas, not perfect ones. 1 hour re-reading and reducing my first draft. I printed it out, grabbed a marker, and aimed for clarity clarity clarity and brevity brevity brevity. When finished, I made my handwritten changes to the digital version. Repeat. Draft the other elements of the application as well. There are two biographical bits (see the application here). While this stuff is important, it's nothing next to your idea. Fill out the application and click submit. Sleep well because you did your due diligence, fought your inner editors, defied your insecurities, and went for something. Tell your students about it because you're a great role model. All in all, I probably put 5 hours into the first round of applying — again, though, that's not counting the years that I've been thinking about and wrestling with teaching character alongside my colleagues. It will take longer — and be much harder — if you've not been doing likewise. 3. My idea isn't good enough! If you are doing something in your classroom that you have reason to believe builds a character strength in students, then you're idea is good enough. 4. But Dave, my idea's not fancy! Look at last year's winners. There is a lot of not fancy there. This is because, as Character Lab communicates again and again and again in their communications to would-be applicants, the goal here isn't to give grants to a bunch of really complicated ideas — the goal is to give grants to folks who have an idea that could be replicated by single, passionate teachers in classrooms around the country and world. 5. My idea is something I teach alongside my regular curriculum — it's not a special extracurricular unit or anything. Some examples of dual-purpose ideas include a procedure you use to help your classroom run smoothly which also reinforces a character strength, or a lesson which teaches a particular subject you need to teach your students while also giving them practice exhibiting a character strength. Susan was already going to teach The Scarlet Letter; her unit, she realized, was a great time to teach perspective, too. Ashley already teaches her students Ultimate Frisbee; it turns out that Ultimate's “ref yourself” rules are great at teaching fairness, too. I already teach argument, and much of that work is done through Pop-Up Debates; it just so turns out that PUDs are, I think, a great way to teach social intelligence, vitality, and persistence, too. Anna Maria has been wrestling with math-anxious kids for years; it turns out that her math patronus idea also has a great shot at producing measurable gains in bravery, too. 6. 1,000 characters to explain my whole idea? Are you ____ing kidding me? Easy with the language, friend. This is probably the hardest (and smartest) thing about the application: you get 1,000 characters to make it happen. Here was my first round application last year (See Fig. 1). Figure 1. The final draft of my project description from last year's first round of the TIG application. Abbreviation is your friend. Use it for those repetitive, pesky, character-devouring nouns. Abruptness is okay. Your reader understands that 1,000 characters is tight. They'll forgive your lack of essay-like transition sentences. Next Wednesday (October 7) at 4pm EST, I'm developing my Internet skills and hosting a free webinar titled “Writing (and Getting) Grants.” It will be helpful for folks interested in applying for this year's TIG as well as those wanting to hear my thoughts on effective grant-writing in general. The tips I'll share apply more broadly, too — for example, I think they make me better at teaching and writing. Thank you to Tanya Ramm for emailing my colleagues and I about a year ago with the Character Lab TIG opportunity. Were it not for Tanya, I would not have heard about this, and I wouldn't be in the midst of the PD experience of my dreams.